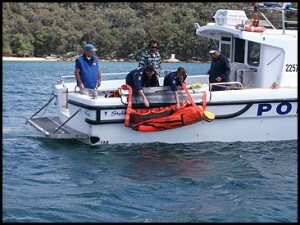 We proudly distribute and sell the award winning Sea Scoopa manufactured by FERNO Australia for man overboard recovery. 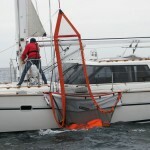 This device helps get your MOB safely and easily back onboard. 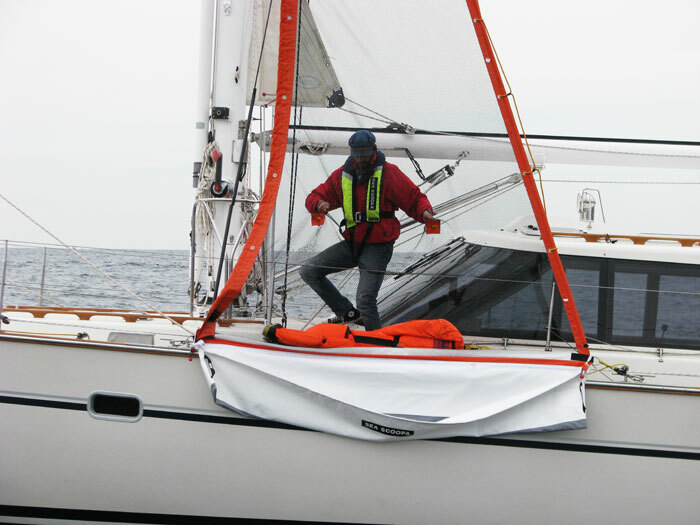 Its design delivers 2:1 mechanical advantage to help you recover a potentially unconscious person, in water–sogged clothing, from the sea. 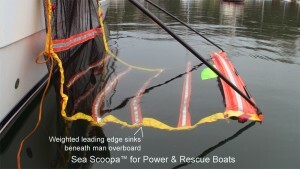 The slideshow at left shows Sea Scoopa for power & rescue craft as well as for sailboats. 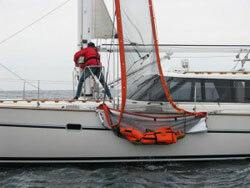 Read on for features, specifications, videos, photos, documents, and reviews of sail and power models of Sea Scoopa. 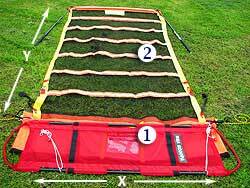 This table shows dimensions of the model for power and rescue craft. 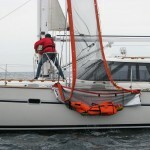 Additional sizes, and Sea Scoopa for sail, are custom fabricated to suit. 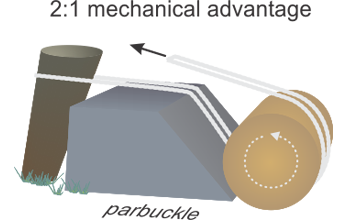 In reading the table, refer to part number notations in the image (the image below the table). 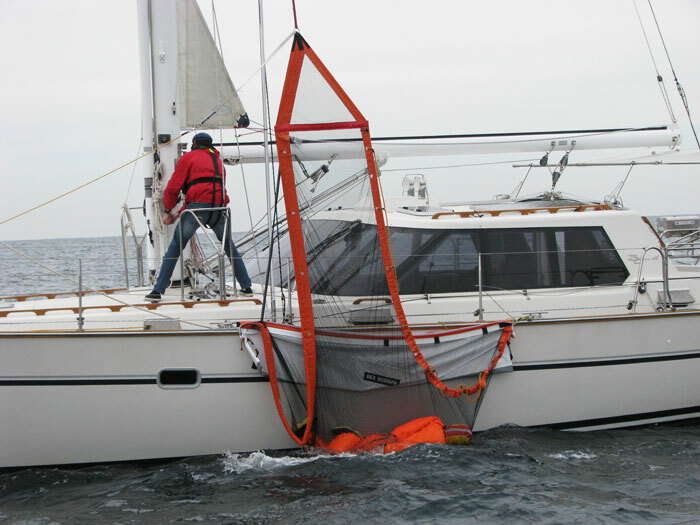 Please contact us for consultation on your particular man overboard recovery needs. Scooping up, horizontal recovery, mechanical advantage, and simple operation are the most important features of the Sea Scoopa. 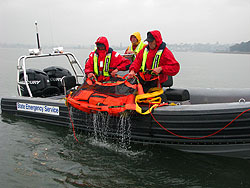 Both models, one for sailboats (shown above) and the other for powerboats or rescue craft (shown at right), deliver on these points. 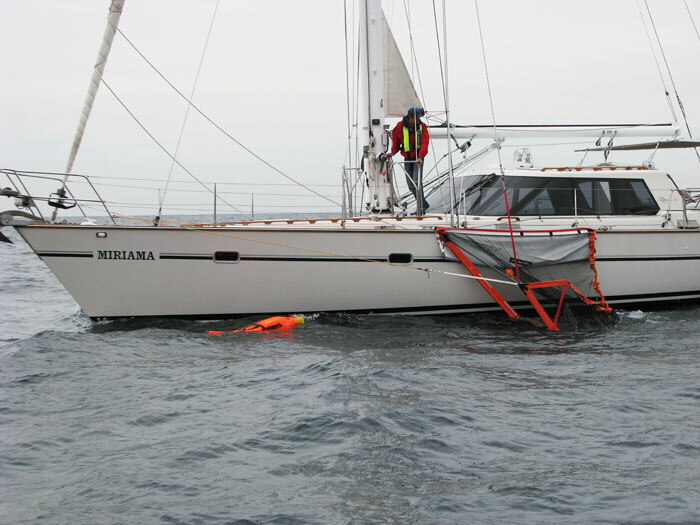 In the best case scenario of man overboard recovery, the victim is quickly spotted, uninjured, and non–hypothermic. 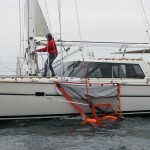 But the Sea Scoopa can even help you recover an injured or hypothermic individual unable to assist in his own recovery. 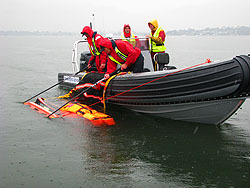 The device is deployed alongside the rescue vessel. 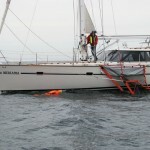 The vessel is maneuvered at dead slow to a position alongside the man overboard. 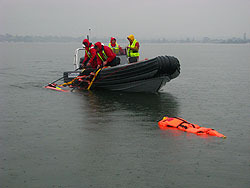 The device’s design enables scooping up the man overboard. 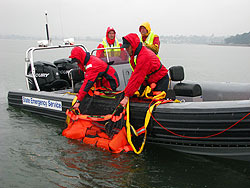 Once engaged, or scooped up, in the device, the person can be lifted back aboard, even if he is unconscious. 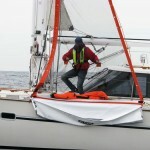 or offsite. 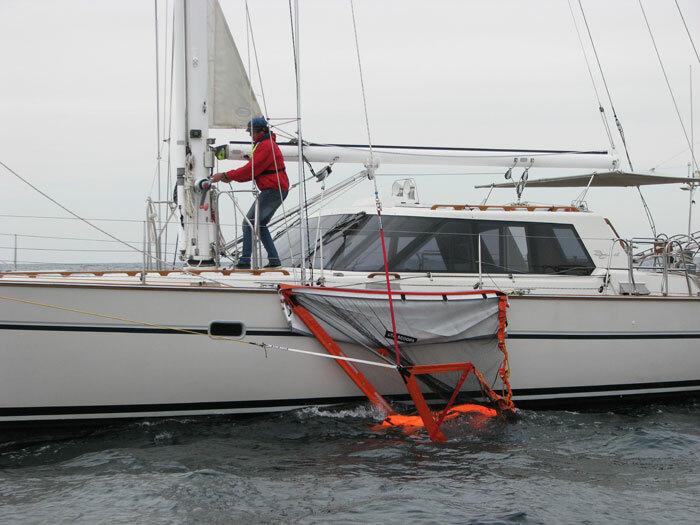 The bottom line is that the Sea Scoopa is engineered to retrieve your man overboard in a horizontal posture to reduce the potential for circum–rescue collapse. 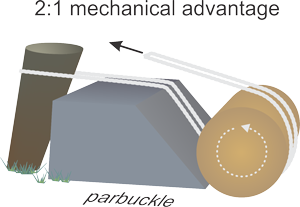 Sea Scoopa employs an ancient method of lifting heavy objects, called parbuckling. 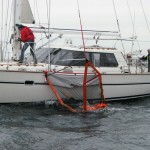 Because the Sea Scoopa passes around the person in the water, playing the part of the rope in the illustration at right, the force required to lift is halved when the free end of the Sea Scoopa is hauled in. 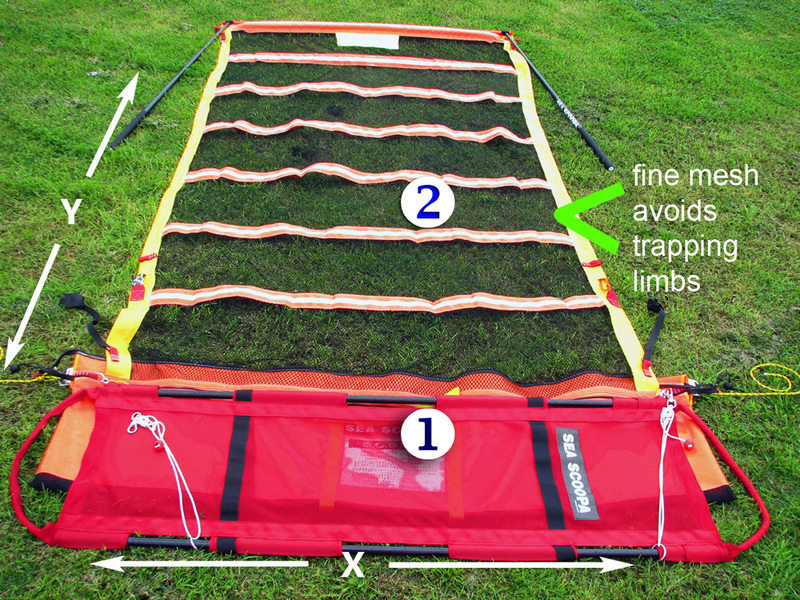 This important mechanical advantage enables more work with less brawn and reduces the likelihood of rescuing personnel injuring themselves in effecting the rescue. 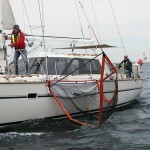 There are two styles of Sea Scoopa. 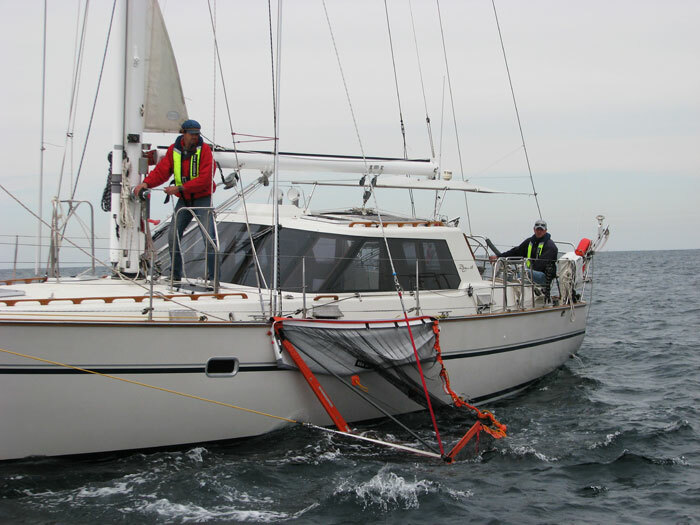 One model is for power and rescue craft, the other is for sailboats and takes advantage of the boat’s mast. 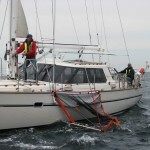 Please see the videos below, as they show sailboat and powerboat Sea Scoopa models in operation. 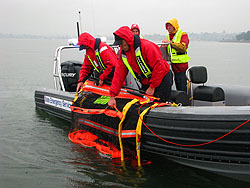 Note that both models can help safely recover even a potentially unconscious person from the water. 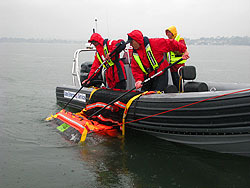 Both models require at least 6 ¼ feet (1.9 m) of clear gunwale to roll a recovered person back on board in a horizontal posture. 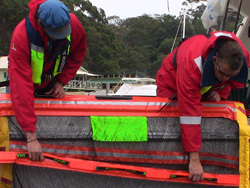 The Royal Australian Navy tested Sea Scoopa and issued it a NATO stock number for the benefit of navies around the world. 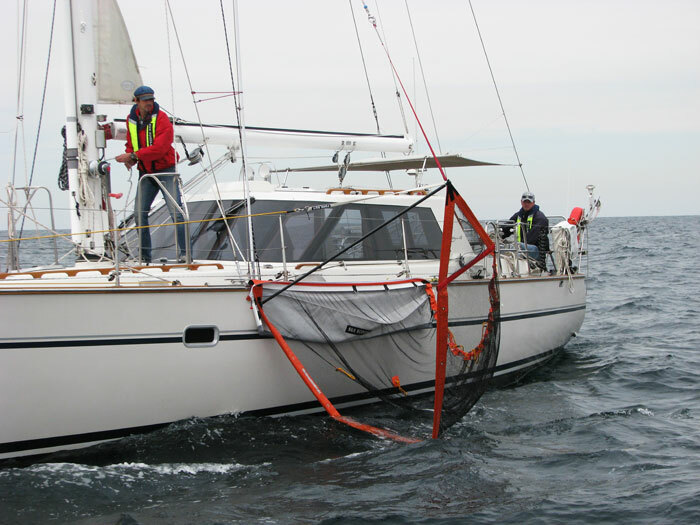 As these photos depict, the design of Sea Scoopa for Sailboats is slightly different than the model for powerboats. 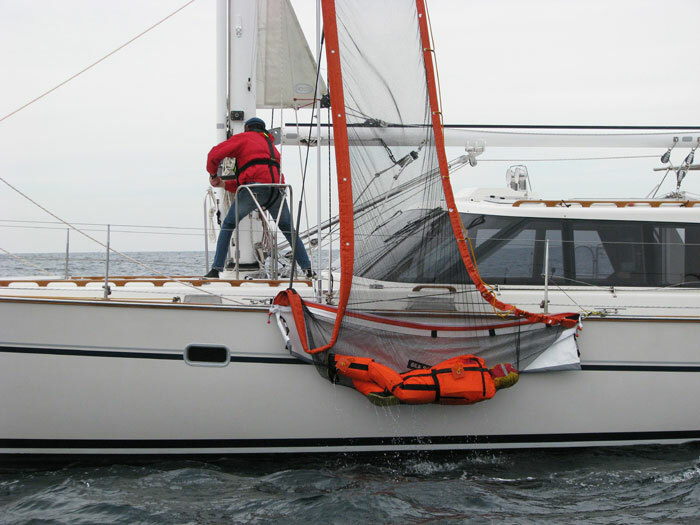 This model takes advantage of the sailboat's tall mast and halyard. Please click a photo for a larger version. 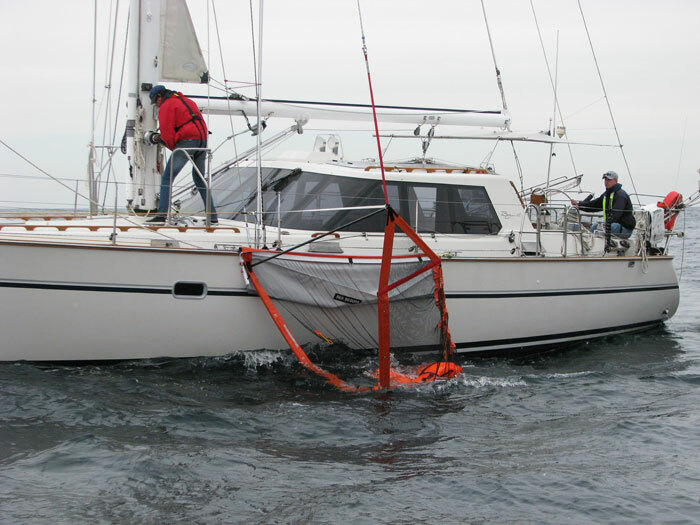 Please select the appropriate user’s manual for operation instructions of your model of Sea Scoopa.